The focal length of a lens is one of the first decisions the camera operator makes when considering lens choices. The focal length of a lens is expressed in millimeters. This focal length determines its angle of view (how wide a shot) and how much the subject is magnified. A prime lenses is a lens that has a fixed focal length like 25mm, 50mm, etc as opposed to zoom lenses which can vary the focal length. Prime lenses are also called fixed focal length lenses. Zoom lenses can be thought of as having a variable focal length. Prime lenses are less complicated than zoom lenses and have fewer moving parts. The main advantage of a prime lens over zoom lenses is that prime lenses have wider apertures. This is so because the optics of a prime lens are simpler than that of a zoom. A wider aperture means a smaller f-stop and that allows more light to reach the digital sensor. This means that a shot can be made with less light and with less depth of field. Bokeh (pronounced “bow-kah”) is the out-of-focus area in an image. Good bokeh changes a distracting background into an impressionistic blur. A Canon EF 50mm lens at its widest aperture of f/1.4 lets in twice as much light as a lens at f/2. This is one full fstop. Each full fstop doubles the amount of light admitted. The f/1.4 lens requires less light, has less depth of field, and will give better bokeh. Zoom lenses typically have higher fstops and therefore require more light. They do not provide good bokeh as readily as prime lenses. A true zoom lens is also called a parfocal lens. It will remain in focus while the focal length changes which is an important quality for video. The aperture of a zoom lens often changes as the focal length changes. For instance a Panasonic 14-140mm zoom lens has an f stop that varies from f/4.0 to f/5.8. Despite the disadvantages of zoom lenses, they are invaluable in documentary work and in cases where there is little time to change lenses. Chromatic aberration can be seen as a slight edge or fringe of color outlining a boundary between light and dark areas in an image. A good lens has little or none of these problems. In professional video it is a common practice to rent lenses that might not be amortized over the length of a production. 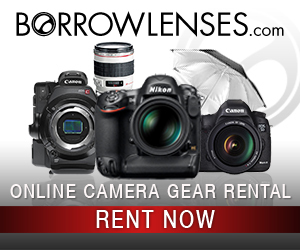 Renting lenses can be a good way to try before you buy. see Borrowlenses.com for more information. We do make a small commission from this company, but it does not cost you any more.